On special invitation by Dr Sanaa Askool, Dean of Student Affairs, EMG founder Drs Daan Elffers and Drs Zeljka Davis were honoured to visit the highly regarded Dar Al-Hekma University for women’s education in KSA (Jeddah). 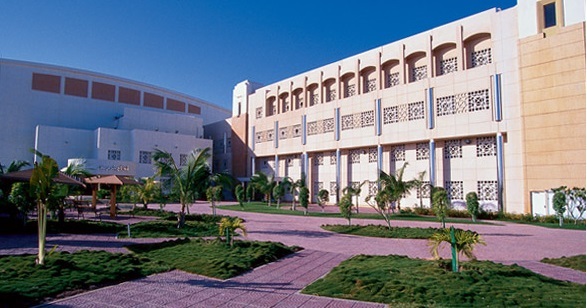 In its young history since 1999, the Dar Al-Hekma has received a number of very high profile guests including Hillary Clinton as US Secretary of State, UK Prime Minister David Cameron, Ban Soon-Taek, wife of U.N. Secretary General Ban Ki-moon, as well as Saudi Arabian royals and senior officials. During the visit, Drs Elffers and Drs Davis spoke with Dr Sanaa Askool, Dr Saleha Abedin (Advisor to the President), management and faculty on various topics relating to women’s education in KSA, corporate social responsibility and sustainable development, and the opportunities of further integrating CSR into the university curriculum. As an immediate next step, it was agreed that Drs Elffers and Drs Davis will give a guest lecture on sustainable development at the Dar Al-Hekma in the very near future.